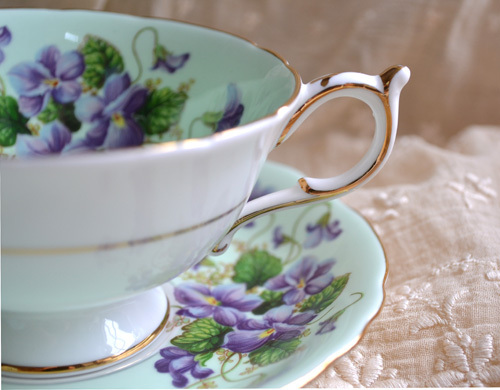 Artful Affirmations: Tea Cup Tuesdays-Violets! Martha and I welcome you to tea cup hop with us today. We enjoy collecting tea cups, we have fun sharing them with all of you, and we Love getting to come and visit you and see your beautiful tea cups! One of my fondest childhood memories is of picking violets in the lawn in spring. just so I could look at them and smell their heavenly scent. I loved their beauty and the scent. This cup took me back to these sweet memories, so I thought I would share her with you. She may look a fairly plain Jane from the front. But inside, she is full of beauty! She has a sweet handle with a good size thumb spur, and a little gold detailing. The color is a bit off, it was a rainy day here, and little sun. But you can see the purple violets against her mint background. And Yes, she is a Paragon! Could you tell by the look? I am guessing that if I checked every cup in my home, many of them would be from this fine company. Herbert Aynsley and Hugh Irving began the Star China Company in 1897. Mr. Anysley being the great grandfather of the many who began Anysley China, my second favorite porcelain manufacturer. 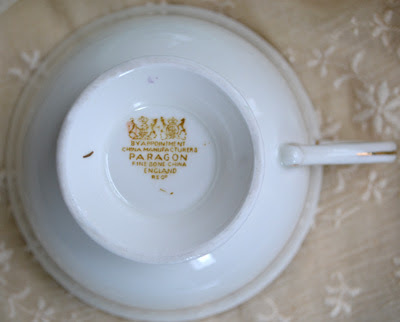 In 1919 the company changed the name to Paragon. Today it is part of the Royal Doulton group. I am guessing that this cup was created around 1938. Thank you so much for visiting me today. I love reading your comments and visiting you in return. If you would like to play along, just create a post with a tea cup in it that you would like to share. Then come back here and sign up with Linky Tools below. My Celebrating Milestones Giveaway is still going strong. I will choose 3 winners on my birthday March 12th, so there is time to enter! Just go HERE to leave a comment, you only need be a follower. I love violets too. They are truly classic. That teacup is precious. The treasure inside is just gorgeous. I loved Downton Abbey! It was a great season. Very special people are showing violet teacups today! I love this one...especially the flowers inside the cup. The color is very pretty. You continue to share such beautiful teacups each week! Thank you for the history on the company, it was very interesting. I like to know the story behind vintage things. Interesting info re: The Paragon factory. Thanks for sharing your photos. I always enjoy looking at your china etc. bela dama condessa de vileta! Violets are so special with the dark color and the strong scent. I love them, too. Your cup is beautiful. The mint fond ist like mirroring the sky and the Violets are so natural. Thank you for showing this springy tea cup and for hosting this sweet event. everytime I see a little sweet and beautiful,cup, I want to buy it to be a part of your cosy "tea party" but I have no place for adding cups, to what is already here, on my shelves in the kitchen-(and everywhere else,lol) so I have looked the other way, and just smiled ,thinking of you. The violet teacup reminds me too of my childhood and picking violets, lots of violets, on the way home from school to give to my Mom.There was a huge field I would pass to and from school and in each season it seemed to be full of whatever would grow and thrive wild.Violets, daisies, dandelions. All made lovely bouquets for my Mom, she told me so. I just adore your Violets teacup. So pretty and elegant. Thank you for hosting our lovely party and for having tea with me. These cups are so unique. Terri, this story could come straight from my life too! What a wonderful cup. Love your minty green Paragon with the violets. Cant beat Paragon! Happy Tea Day! Beautiful cup...and your special memory is so sweet and heart-touching..I can totally picture you as a little girl! Hugs..
Oh, your teacup is a gem! I love violets too and guess what? I have shared violets this week also. Spring must be on its way! Thank you for sharing another sweetheart of a teacup and enjoy your day. Your tea cup is very beautiful today; inside and out. It just reminds me not to judge by the outside, because within is where beauty lies. Violets are truly a calming flower. I enjoyed the history you shared with us today. Aynsley is a favorite of mine. Thank you for having us over today. Tea time was great! Yesterday I was busy listing some items in my shop and when I got to the crochet tea cups, I made a point of telling myself......'Post about this tomorrow and sign up on Terri's linky list!" and so here I am. I'm number 16 on the list. Your cup is beautiful...and I love visiting with you! Off to peek into the other links. I also love violets, and lilacs, and lavender and violas - LOL! And at one time or another have grown them in my yard (until the destroyer pulled them up, my husband - the man can't tell a flower from a weed, sigh). The only thing I left are 3 lilac bushes. I love that cup, I actually have a few of them. They belonged to my husband's grandmother. She gave them to me years ago, and they are so very pretty. I treasure them especially since she gave them to me instead of to one of her granddaughters. My garden is alresdy full of violets and so I can enjoy them in nature as you used to do. My sweet memories of violets remind me that a bunch of them was the first gift that I got from my ex-boyfriend, now my husband, maaaaaaaany years ago! I'm also following Downton Abbey here in Portugal and I'm really enjoying it. Thanks for the lovely tea. 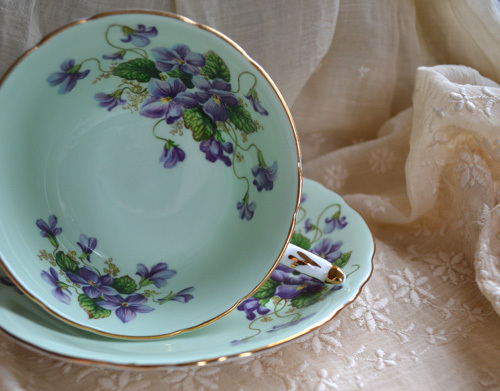 I love the violets in the cup, and the Dowager is also a favorite of mine! 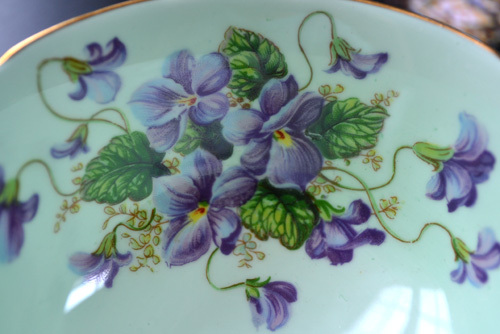 That is a truly exquisite cup, I adore the violets. The violets inside the cup are so beautiful. I'm not into tea cups. The only set I have is one that my daughter bought for me at a garage sale when she was about 8 and I cherish it. BUT..I LOVE violets with a passion and I love this set. Terri, I love both violets! 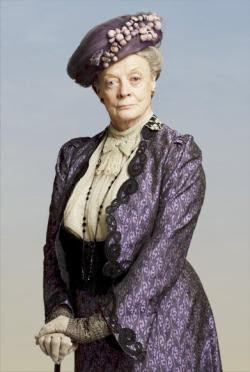 ;-) Maggie Smith is just the best! Me too....picking violets as a child. One of the first things we did in the spring when it was so good to get out in the warmth of the sun again! Well, Terri, this must be the time of violets on the mind! Sandi featured them, too, and being February, I suppose it is appropriate - the amethyst color - my mother's birthstone. I'm thinking flowers, too, this month - but featuring the lily of the valley. A lovely cup display today, milady! 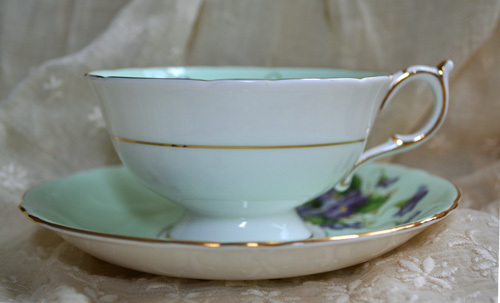 I do so enjoy reading your blog ... these teacups remind me of my beloved mom ... wish I had a couple of these myself. Although plain on the outside, this may be one of my favorites yet. I remember when I was young, my mother would sugar the violets we gathered, and place them on top of cupcakes. What a treat they were. Holly M.
We all have violets on our minds..horticulturally and culturally! Lovely teacup! Violets are so special. You know its Spring when you find the little purple violets blooming in the grass and the piney woods. My grandmother Lynch loved to hunt for violets every Spring, they bloomed usually in March where we lived in Alabama. Some flowers would have soft darker colored petals, she called these "velvet-eared violets". Thanks for sharing the pretty china cup. Thank you a million times for that link to Downtown Abbey. I have not had the privilege of watching it yet. I adore Maggie Smith. She is such a commanding woman in the roles that she plays. I adored her in The Secret Garden. It seems to me she was born to play all the roles she is assigned to. I shall certainly explore that link! What a fun post, I luv Violet as well. Am so hooked on Downton Abbey. And Maggie Smith steals the show. What a wonderful career she has had. Lovely tea cup!! Love those violets inside the cup!Thank for the chance!! And happy happy birthday...soon!! Your cup is divine Terri! I still have violets bloomimg in my garden with temps in the 20's here at night. Pa. is cold, so I really appreciate them. They are so pretty to put in a bud vase, to keep nearby. Thank you for sharing your beauty with us...and i love how you are so knowledgeable of the china, I am learning a lot! I adore violets. Mine haven't come up yet but I am waiting! I think we are all ready for spring. 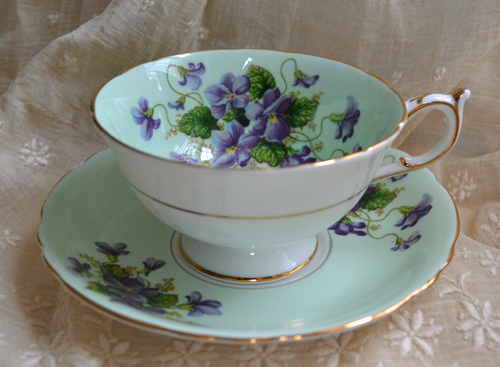 Nothing at all plain with this tea cup, it's absolutely gorgeous - love purple ... now this one is extra special. this cup is completely elegant!